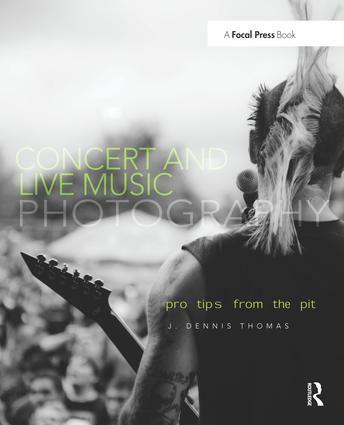 Jam packed with over 160 photos from today's top concerts, this book will not only give you the information you need to start taking rockin' photos of your favorite musicians, but will spark your creativity when you're anticipating the next shot. For the on-the-go photographer, a cool companion website features additional tips, venue troubleshooting, and an equipment checklist when you need to think on your feet while running to another gig. J. Dennis Thomas is a professional photographer and author based in the "Live Music Capital of the World?, Austin, TX. He has written more than a dozen highly successful books for the Wiley Publishing "Digital Field Guide? series as well as articles in many different areas of photographic technique. Dennis writes the popular J. Dennis Thomas Digital Field Guide Companion blog (http://deadsailorproductions.com) as well as the equally popular Austin Live! (http://austin-live-music.com), and Capturing Better Photos and Video with your iPhone (http://betteriphonephotos.blogspot.com/). J. Dennis Thomas has been photographing bands and concerts since the early 90's. He is represented by Corbis Images and his live music work has been featured in print in such magazines as Rolling Stone, SPIN, Country Music Weekly, among others. He has also contributed photography to many books such as Thomas H. Greer's Rock Shrines and Photos That Inspire: Photo Workshop by Lynne Eodice. Dennis' entertainment and celebrity photos have also been featured all over the web, including rollingstone.com, MSN Wonderwall, Spinner.com, and AOL.